Reporting in Salesforce is one of your most powerful features when you must prove value to the business. Key reports built in a matter of minutes with a simple drag-and-drop, easy-to-use interface is extremely effective. As an administrator, you must have a solid grasp of all the Salesforce reporting options available when reporting requirements open up. Let’s have a look at some of the more advanced reporting options that Salesforce offers us beyond the drag-and-drop interface. By default, Salesforce gives us standard report types. Standard report types are already present for all of our standard objects, such as “Contacts and Accounts” or “Opportunities with Products.” Salesforce also automatically created standard report types for every custom object and relationship we build. The type of report Salesforce created, such as with a “with” or “and” relationship, will depend on if you are using a Lookup or Master-Detail relationship. But what if you need to report on more than two objects at a time? What if you don’t want to report on only “with” relationships? This is where custom report types come in. Creating a custom report type involves selecting the relationships and the objects you would like to include. Depending on which primary object you choose (in this example, it is “Account”), the wizard will give you access to its child objects to also report on. You can also report on grandchild objects, up to a total of four objects. You will notice that we can also include whether the object selected “has” to have related records to show up in the report. This is useful if you would like to show a report such as Accounts with and without Opportunities. From the picture above, you can see we are looking at Accounts without Opportunities that are closed equal false, showing us all accounts with open opportunities. Custom summary formulas are used exclusively on reports and can be positioned to calculate complex data from your summary levels. At first this seemed a bit daunting to me, but let’s look at an example that will help put this into context. Custom summary formulas are added into a report like any other field, and once dragged into the report, we can begin creating the formula. 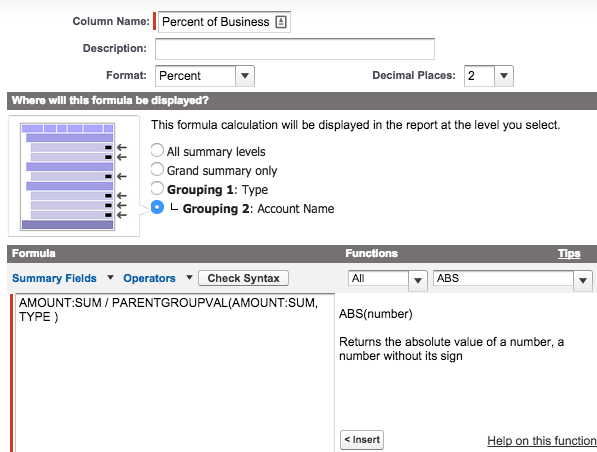 You have access to most of the functions available when you are creating a normal formula field with a few extras to deal with specific situations in a report. This is just a small glimpse into what can be created with custom summary formulas; we can create averages, moving averages, totals of different groupings and more. Analytical snapshots capture data at scheduled points in time, which then allow you to build historical reports on that data. This is especially useful if you need to see long-term trends in your data that is not possible with standard functionality. The normal reports in Salesforce allow you to see the data “as-is” in real time. But if, for example, you wanted to see how many cases are open on a single day and the trend that this creates, you would need to use analytical snapshots. First, you will need to create a source report. This report will contain the data that you want to historically trend on, so if we are sticking to our historic open cases example, we will need to create a source report that shows us all open cases open today. Finally, we can create the snapshot, which includes naming the snapshot, selecting the source report, selecting the target custom object and setting the frequency that this should run. Historical trending is a new feature that was first released in Winter ’14. It is a niche feature but can make your life easier if you need to track small daily or weekly data changes. 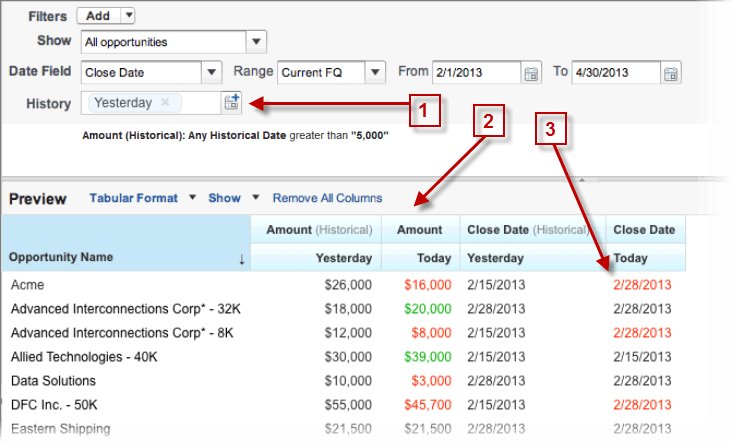 Historical trend reports allow you to track up to eight fields on the Opportunity object and up to three custom objects. You can select up to five snapshots dates, such as five business days or five business weeks. This data can then be reported on and can be viewed in the same row to see the direct changes to the data. (1) Snapshot up to five dates to track daily or weekly trends. (2) Current and historical values are shown side by side for easy comparison. (3) Changed dates and amounts are highlighted in red or green.